In previous incarnations the cafe’s kitchen counter/bookcase was cut up into garden furniture and end tables, among other things, and the cafe’s tables became, well, tables – with the only transformtion being accomplished with another layer of paint. In this incarnation, the tables have once again become tables – but they’ve been snazzed up thanks to my new favorite possession, an electric sander. Also, in this life, they have titles! Now that I no longer own a house over a disco, I have a standing offer from HacıAli to stay in his old house above the shop, since it (the house, not the shop) is usually empty. Considering that it’s more than 10 hours on the road from Bodrum to Avanos, we don’t get up there much, but Harun and I took HacıAli up on his offer on our way up to Georgia. It got us out of the Aegean and on our way towards the Black Sea – with planned stops at ‘The Hittite Sites of Central Anatolia’. At just about the half-way point between Konya and Çorum, not only was Avanos conveniently located geographically, an overnight stop there also gave us the opportunity to ‘feel the pulse of the nation’ in the wake of Turkey’s ostensibly ‘unsucessful coup attempt’. As soon as we sat down in front of HacıAli’s – where we happily sat for hours, drinking Turkish tea and ‘taking the pulse’ – I received a text-message from a friend containing a PDF file with a list of all the educational institutions being closed because they ‘had ties’ to the ‘coup plotters’. And thus, as Harun likes to say, “I was fired before I even started”. Now, I can pretty much vouch for everyone in the department I was going to be teaching at and say that none of them ‘had ties’. And it was this apparent indiscriminateness of what some might call the ‘post-coup efforts to right the country’ that made it so difficult to ‘take the pulse’ as we wanted. Harun and I were pretty much the only people we found who didn’t first lower their voice and look around (and in one case, put away a cell phone ‘because it could listen’) before venturing an opinion on the only thing that was on anybody’s mind anywhere between Bodrum and the Georgian border (which was where we were headed, remember? Don’t worry, we’ll get there…). In the interests of protecting the privacy of the possibly (but not necessarily) paranoid, I will just randomly intersperse some comments along with some photos. Just chalk everything up to ‘Anonymous’. Hattusas is even more like an open-air museum than the open-air museum in Cappadocia famous for its cave paintings, since here in Hattusas you drive from ‘exhibit’ to ‘exhibit’ (or walk, if you are in good shape and prefer not to burn fossil fuel). No cave paintings here, but lots of interesting stuff, like the layout of ancient Hittite dwellings, and cows. Whether or not these cows were descendants of ancient Hittite cows, I cannot say; however, cows did figure prominently in our journey from Hattusas onwards. Yup, me, there on the right. To give you an idea of scale. Lion on the right is original, lion on the left is to show what the lion on the right used to look like once upon a time. Of course, seeing the artefacts in a museum in Ankara isn’t quite the same as seeing them “in situ”. 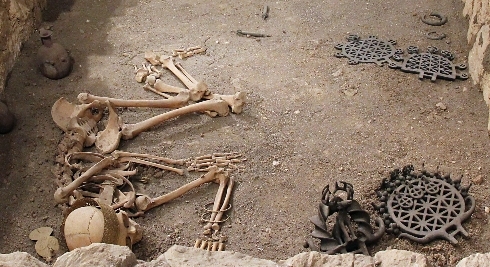 Alacahöyük (a “höyük” is a “mound”, as in “burial mound”) is done up rather nicely; you can walk around the site and peek in the graves (note the crown on this guy here) before you go into the museum building. There are no grazing cows here, but if you’re lucky, you may run into the local geese herder marching his flock home in the evening. Also, there is a lovely cafe across the road, run by a woman from Erzurum who makes delicious gözleme and who will engage you (or your Turkish-speaking companion) in long discussions about local politics and rail against all things in general. Right… we were leaving Aphrodisias, and I was giving Harun the option of camping at a place about 2k from the site, or driving all the way to Pamukkale (which was not really all that far – we could make it in time for dinner). I was betting ’50-50′ (under normal conditions, I would have been betting ‘0’, but given that we had just been through a ‘foiled coup’ less than a week before we began our previously scheduled road trip, at its outset I had insisted on ‘No Improvised Sleeping Devices’. Regardless, Harun drove right past the campsite I’d read about without even so much as stealing a glance). You see, despite a rather pleasant musical interlude we’d spent at an ‘official government campground” in Datça last year, and despite a cheap ‘establishment’ by the beach between Fethiye that we’d discovered the first time we did the drive between our place in Bodrum and ‘the family’ in Adana, Harun has little faith in campgrounds. He’d rather we just pick a spot and camp on our own, away from people (by the seaside, if possible). Since he is rather good at picking spots, I’ve learned to go along without much complaining. However, given ‘the circumstances’, I felt it necessary to bring up the fact that 2 strangers camped on the edge of the woods someplace might prompt a call to the jandarma, if not shotguns a la Deliverence. Having thus chosen ‘Option No. 2’: Hotel in Pamukkale, I thought it might be a nice idea to stop for dinner at this great kebab joint in Denizli, just a half-hour from Pamukkale and the city at the center of the province where the famous ‘Cotton Castle’ (cotton: pamuk, castle: kale) travertine is located. Unfortunately, although we’d been to this kebab joint twice, we knew neither its name nor its exact location, just that it was somewhere close to the bus station in the center of town, and since we’d found it so easily the second time, I figured we could find it easily the third. We did not. Instead, we ran into a ‘Democracy Meeting’ (‘Demokrasi Mitingi‘ in Turkish, and in Turkish, ‘miting’ means ‘protest’, so in some sense, I guess, a ‘Demokrasi Mitingi‘ might be considered a ‘Democracy Protest’). If you’ve never heard of a ‘Democracy Meeting’, that’s okay, neither had I, nor had anyone else in Turkey that I know of, until just then, after the ‘foiled coup attempt’, when these meetings began springing up spontaneously all over city centers in Turkey – although ‘spontaneous’ really wouldn’t be the right word for them; they were more like ‘Thank-you-for-your-help-in-putting-down-the-coup Parties’ organized by various local administrations across the country. The one in Denizli featured a big tent with seating, music and lokma (fried dough), and on this hot, hot summer evening, it was just getting going as we walked from where we parked the car to where we thought ‘our’ kebab joint was. In fact, to paraphrase Gertrude Stein, there was no kebab joint there. In fact, we couldn’t seem to find any kebab joint anyplace. Instead, the entire center of Denizli seemed to have been taken over by ‘cafes’ offering little more than tea and toast, and the temporary tent of the ‘Democracy Meeting’ – which I would have gladly joined if it had been offering something a little more substantial than lokma. Thus, I would have to rate our stop in Denizli the first failure of our road trip. There was nothing to do but settle for ‘chain kebab’ (salty gunk at some less-than-famous franchised restaurant), make our way past the now-in-full-force ‘meeting’, get back in the car, and head towards Pamukkale – passing by, as (bad) luck would have it, Denizli’s best kebab restaurant on the way out of town. So, I think this is the appropriate time to offer up another disclaimer: This travellogue will not necessarily provide you with names of or directions to anything. (I think I already brought up the lack of photos in in Part 2). This is not because I’m intentionally holding back; it’s because I forget. Like, for example, I forget the name of the pension we stayed at in Karahayıt. Karahayıt is the laid-back town down the road from Pamukkale, which is usually not at all laid-back, but frantically full of tourists (although not this year). Instead of ‘tour-bus tourism’, Karahayıt tends to get a more ‘fambly-style’ (old lady?) ‘health-tourism’. The appeal is the sulphury-minerally red water that the various (and clearly) family-run establishments have piped into the rooms. In fact, we ended up in a room with a home-made bathtub (a half-wall built some ways away from a floor drain, which you stick a tall plastic pipe in when you want to fill up ‘the tub’). The water is steamy-hot and said to be good for sore bones and joints, and I would highly recommend it in the wintertime. We stayed at a place (I know I wrote down the name and phone number somewhere…) run by a little old lady whose younger family members were said to be busy running the souvenir shops and restaurants on Karahayıt’s main strip – which is easy to find, because it’s also Karahayıt’s only strip. As soon as we settled down in our pension room, we wandered out to the strip ourselves, to mix with the other local tourists (no foreigners in sight) and mill about for awhile before heading back to our emphatically non-air-conditioned room. The next morning, we steamed ourselves in stinky red water before walking outside. Something was going on, you could just feel it in the hot-and-sticky air. There wasn’t enough milling about, enough touting for tourists. It appeared as if everyone had packed up and gone home overnight. It wasn’t until we sat down to what was to be the first of many unmemorable breakfasts over the next month (a sad thing, worth mentioning in a country with olives and figs growing all over the place, and during high-season for tomatos) that we learned that a state of emergency had been declared throughout Turkey. SO yes, I’ve been out of touch; but now I’m back in touch. In fact, the past month has done wonders for letting me “get in touch” with the state of my nation, Turkey. So (thanks, Nancy), as I started to explain to a friend of mine in NY when she wrote and asked, “How has your summer been?…. And thus it was that we packed up the Yarıs (our less funky replacement for the Twingo) and headed out into the great hinterlands of Erdoğanastan, 4 days after an event hence to be referred to as “the unsuccessful coup attempt”, unaware that before nightfall we would be travelling through not just a state of confusion, but a state of emergency as well. Here then, to the best of my ability, and in light of my promise to my mother to stay out of jail (inşallah), I heretofore (or something like that) begin to relate some of the interesting people, places and things we encountered during our trip. With pictures. An appropriate way to start our tale, I think. Our feet set out on the road, and we encountered many faces. If you’ve read some of my earlier blog posts, then you may know that I decided to take 52 of these postcard-size collages and turn them into a deck of fortunetelling cards. It seemed the logical thing to do, since the number of people really interested in looking at artwork seemed infinitessimely smaller than the number of people interested in my providing them with some kind of insight into their worlds. The Art Fortunetelling was my way of saying “ok”. As I may have mentioned earlier, it was way easier for me to find some meaning in the cards than to try and put some meaning in them intentionally. Again, seems logical, if we get talking about art as a subconscious rather than a conscious carrier of meaning. In fact, it seemed to make so much sense that I decided it was time to make a second deck. And considering that we are in a sort of transition stage – Will we be moving to Foça in September? Or will I just be going up to teach a couple of classes, and coming back down to Bodrum until we can get our act together and finally head (a bit) north? Will I even have students sign up for the classes? Will I get involved in something else even more new and interesting? How will our garden grow? As soon as I finish up here I will probably go ‘throw the I Ching’ (or as the web site says, ‘toss coin virtually’), but in the meantime, I could go for some interpretation. I might interpret that as consciously trying to step back and look at a situation with multiple aspects/possibilities in a cooly detached way, seeing the beauty of all the possibilities, while beneath this was a seething mess of desire and fear of the unknown.